LAGOS earrings from the Newport Collection. Signature 18-karat yellow gold Caviar beading. 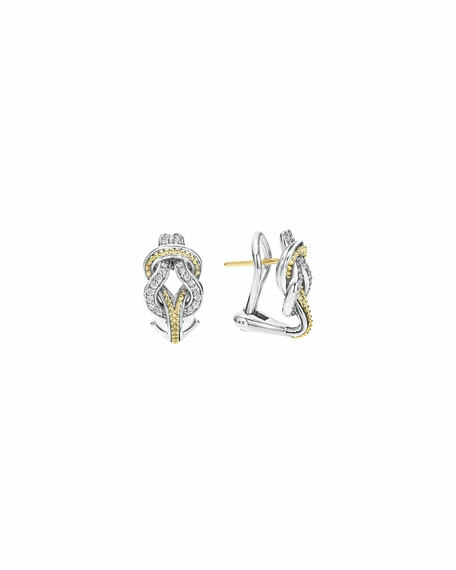 Interlocking knot-motif station with pavé white diamonds. Armenta earrings from the New World Collection. Blackened sterling silver. Emerald-cut blue quartz, labradorite, and white quartz centers. Bezel-set champagne diamonds trim setting and top Crivelli crosses. 0.42 total diamond carat weight. Wire backs for pierced ears. Made in the USA. Pebble-textured 18-karat yellow gold electroform and sterling silver. Small hoops shaped like a Buddha belly. Approximately 1"L x 1/2"W. Hinge-post backs. Handcrafted in Bali. Didi door knocker earrings by Kendra Scott. Your choice of metal plating over brass. Post backs for pierced ears. Approx. Didi door knocker earrings by Kendra Scott. Your choice of metal plating over brass. Post backs for pierced ears. Approx. 2.3"L drop; 1.6"W. Imported. Please note: Due to the one-of-a-kind nature of the medium, exact color patterns may vary slightly from the image shown.